Farrar Straus Giroux, New York, 2005. 36 pages. I find it rather amazing that M. D. Usher was able to write an accessible picture book biography of Socrates, based entirely on ancient sources (as the endnote declares). 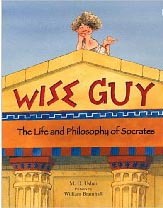 The book tells an entertaining, vividly illustrated story, with sidenotes on scrolls that simply and clearly explain details of Socrates’ life and philosophy. I especially like the pictures of Socrates dancing. We’re told he loved to party. This isn’t a book that students will seek out for reports, but it’s an entertaining picture book biography with surprisingly intriguing ideas. Reading this book gave me the idea of making a display at the library of picture book biographies — as a group they are underappreciated and hidden away in the more “serious” biographies. But they make intriguing reading, are highly educational, and give you an inspirational look at the lives of some truly great people. Harmony Books, New York, 2009. 401 pages. This book doesn’t present a simplistic approach. I like that about it. Recently, a friend asked me when I’m going to forgive my husband. I was taken aback. I thought I already have forgiven him! But on thinking about it, forgiveness from a deep wound is complicated. You still have pain from the wound. New things happen that bring up new anger. If lies were involved, there’s a certain need to discover truth. Then there’s fear of being hurt again, especially if the person who hurt you is unrepentant. Judith Orloff acknowledges the complicated nature of emotions, and presents tools for helping you face the negative ones and begin transforming them into positive ones. The word transformation sums up her approach. She’s not trying to make you give up or suppress your negative emotions. She’s simply giving you tools to begin transforming them. Another nice thing about the book is that, while reading it through gives you good reminders of helpful ways to lift your emotions, when you actually find yourself in the negative emotion, you can use the book as a cookbook of ideas to help you transform it. As a physician, she has some ideas of how your body and biology can help you. For example, if you’re lonely, boost your oxytocin. If you have trouble with fear, lower your intake of caffeine. As an empath, she also gives you ideas for letting your intuition help you. As well as some ideas about spirituality, energy flow, and psychology as they relate to these emotions. Altogether, this book has many wise ideas about dealing with negative emotions, and I imagine at least one of these ways of looking at them is one you’ve never considered before. I also like that she doesn’t say that negative emotions are bad and positive ones are good. The use of “negative” and “positive” have more to do with how they feel. She acknowledges that everyone has negative emotions aplenty. But she helps us use the energy they bring with them to transform into a more powerful and more pleasant emotional state. I’m not sure how much of this book I really grasped on the first reading. As I said, I think I’d like to pick it up the next time I’m feeling depressed, for example, and think about her ideas for using that energy to move into hope. This book is based on a discovered treasure — a little handmade book that Arnold Lobel had given to Crosby Bonsall as a Christmas gift long ago. The book was black and white, so for this delightful picture book version, his own daughter filled in the drawings with color. The frogs and toads in this book were created before The famous and beloved Frog and Toad. 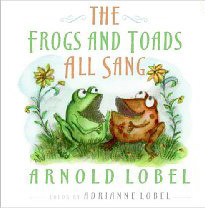 The book consists of ten short, sweet, and silly poems, each including frogs, toads, or polliwogs. There’s nothing profound or tremendously significant here. But somehow, the poems beg to be read aloud. And when you finish reading the book, I am quite sure you will be smiling. Very nice. And a lovely discovered legacy from a much-beloved author. G. P. Putnam’s Sons, Penguin Young Readers Group, September 2009. 441 pages. 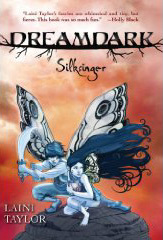 I thought that the first Dreamdark book, Blackbringer, was excellent. Laini Taylor built an intricate world of feisty fairies and told a tale of a young fairy becoming a champion and saving the world. In this book, Laini Taylor weaves together six or seven different plotlines in a beautiful tapestry rivaling the carpets of the Silksingers. The world is already built (Yes, I think you should read Blackbringer first. ), so now she can get down to the business of weaving a glorious tale. Not that she doesn’t show us more surprising and imaginative details of that world. We meet new fairies with wonderful new magical abilities, whose clans have long and storied histories, all wound and interwoven together. Magpie is back, the feisty champion from the first book, with her friend Talon. (And the romance between them is so gently done!) The book opens with Magpie taking on a challenge. “‘The Tapestry of Creation is failing,’ hissed the Djinn King. Then, by contrast, we meet Whisper Silksinger, helpless in a desperate flight from a horde of devils. After her grandparents sacrifice themselves to save her, she’s alone on the ground, a “scamperer” whose wings don’t work. “Tears glistened in Whisper’s lashes but didn’t fall, and ashes caught there and clumped. She was too stunned even to grieve. The teakettle had rolled onto its side in the sand and she stared at it, unblinking. “Inside it burned an ember. It didn’t look like much, a small seed of fire, but devils would kill for it, her grandparents had died for it, and the world depended on it. And now it fell to her to keep it safe. We find ourselves wanting sweet and vulnerable Whisper, with the amazing gift, to be able to find the strength to save the world. To somehow survive long enough to complete her task. Meanwhile, someone else with secrets shows up along her path. He wants to be a champion. Why do visions keep leading him to quiet little Whisper? And who set the devils on Whisper and her grandparents? Will they find her again? What power has even dragons under its control? I got to read an advance review copy of this book, but it is already available for pre-order on Amazon. The September publication date will give you time to read the delightful first book. Then you will be set to be blown away by Silksinger. Although this book comes to a satisfying conclusion, the saga is not over yet, and I’m so glad! I hope the audience for these wonderful books will build as the series continues, because if Laini Taylor continues with books like Silksinger, the series will be truly magnificent! One of the author’s strengths is to come up with imaginative details. I don’t want to give anything away, so let me just say that the abilities of the new clans and fairies who are introduced are surprising and delightful. It’s also great fun to hear stories of adventures that could be happening right under our noses, and we are just not perceptive enough to see it. One thing’s for sure: If you ever find an abandoned bottle that appears to have a genie inside, whatever you do, don’t open it! Dreamdark gives you fairy tales unlike any that have gone before. Ace Books, New York, 2001. 355 pages. Corie is the illegitimate daughter of a lord. She has been apprenticed to her grandmother, a village witch. She never met her father, but after his death, her uncle found her and persuaded her grandmother to let her spend summers at Castle Auburn. “When I learned who my traveling companions were to be, I stopped complaining and began dreaming. Bryan of Auburn was everything a young prince should be: handsome, fiery, reckless, and barely sixteen. Not destined to take the crown for another four years, he still had the charisma, panache, and arrogance of royalty, and not a girl within a hundred miles of the castle did not love him with all her heart. I did, even though I knew he was not for me: He was betrothed to my sister, Elisandra, whom he would wed the year he turned twenty. This is the opening of the book Summers at Castle Auburn, and the trip does become an important memory for Corie, but partly because of how much her opinions change over the years. As she reaches adulthood and Bryan approaches his coronation, Corie begins to think differently about the custom of taking the aliora into captivity, and about her Uncle Jaxon who is so skilled at capturing them. She begins to think differently about Bryan. We as readers can see from the beginning his petulance and selfishness and pride, but Corie’s eyes get opened more gradually. After that, she begins to see more clearly her sister’s feelings about the upcoming wedding. Or does anyone really know what her sister is thinking? As for Corie, what place does she have in the castle? Can she do anything about the injustices against the kind aliora? Which of her two lives — in the castle or in the village — will determine her life path? Our library has this classified in the adult section, but it’s a coming-of-age tale, and completely appropriate for teens, too. I found the story compelling enough for it to keep me going without stopping until the early hours of the morning, much to my annoyance! But it was a good tale, and though I fervently wished at work that day that I had read it in at least two sittings, I was still glad I read it. There isn’t a lot of magic in the story — the main touch of fantasy is the fairy-people, the aliora and the imaginary herblore. A fine tale of romance and power in a medieval setting. Harcourt, Orlando, 2008. 471 pages. Katsa has a Grace. Like every child whose eyes settle into two different colors, Katsa has an extraordinary gift, and was sent to the court of the king, her uncle, until it became clear what her Grace would be and if it would be useful to him. When she was only eight years old, it became clear that her Grace was killing. She can fight and defeat anyone, with weapons or not. The king did indeed find this gift useful, and from the time that she was ten, he ordered Katsa to do his bullying for him, to punish anyone who displeased him. Now that she is eighteen, she is finding ways to rebel, ways to use her Grace to help people, to fight injustice instead of causing it. On one mission, she encounters a mystery. Why would anyone want to kidnap the kind old father of the king of Lienid? Then she meets the old man’s grandson, a prince of Lienid, who is also apparently Graced with fighting, and the first real challenge she’s ever encountered. They begin practicing together, and Katsa is horrified to find herself beginning to trust this man. They decide to tackle the mystery together. This book has a great story of adventure against impossible odds, with a tremendously likable heroine who can defeat almost anyone or anything. Woven into the story is Katsa’s struggle with who she is. Is she a killing machine for a bully of a king to use for his purposes, or can she choose to be something more? I found the romance particularly wonderful, as we watch Katsa wrestling with her feelings and her habits of not trusting anyone. I thought that part especially well-written and delightful to read. Parents, this book isn’t for young teens. Katsa is not interested in marriage, and she and the prince decide to be lovers. Their encounters are described tastefully, even beautifully, but they are described. You might want to discuss your opinion of Katsa’s choice not to marry. To me, it seems consistent with her character and her difficulties with trust. But on the other hand, it’s clear that either one of the lovers would be completely devastated if the other one were to take advantage of the “freedom” they’ve been granted. I like the way Kristin Cashore shows us Katsa talking about being free to leave her lover, but then having tremendous difficulty actually doing it, even when their lives depend on it. All in all, I thought the romance, with all its ambivalence and wildly fluctuating new feelings for Katsa, was the most beautifully written part of this magnificent book. I’m amazed that it’s a first novel, and am now among those eagerly looking forward to the sequel, Fire, which comes out in October 2009. Harper Audio, 2004. 5 hours, 5 compact discs. When I saw the library had The Last Battle on audio CD, performed by Patrick Stewart, I snapped it up without a moment’s hesitation. Patrick Stewart could make the phone book sound entertaining! 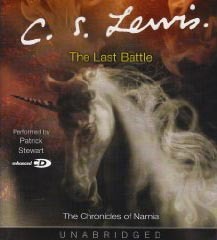 This is the last book of The Chronicles of Narnia, which I’ve read so often I’ve lost track of how many times. It struck me on this listening that this one isn’t so much about the story as it is about describing the wonders of what heaven may be like. After all, the main characters don’t win the last battle — they are defeated, but then Aslan makes all wonderfully right. So I’m not sure you could really enjoy this book if you don’t believe in heaven. If you do, however, here’s a chance to glory in the magnificent voice of Patrick Stewart marvelling over the wonders of what may be in store for us. Definitely an uplifting treat! Review of the print version. Doubleday, New York, 2001. 288 pages. Even quite a few years into the divorce process myself, I still feel that anyone going through a divorce can benefit from thinking about forgiveness, if only for your own sanity! I’ve read quite a few books on forgiveness. This one by Robert Karen took a more academic approach, a psychological approach, to the subject. I especially liked the way he explored many different aspects of forgiveness, including our natural tendency not to forgive. I read the book slowly, and it gave me plenty of food for thought. I maintain that thinking about forgiveness can’t help but be a good thing. “When I first turned my attention to forgiveness, it seemed a worthwhile, if unexciting, topic. But as I immersed myself, I realized that forgiveness is as fundamental and important as any topic in psychology. There are few places it can’t take you. It embraces the meaning of love and hate, the nature of dependency, the torments of envy, the problems of narcissism and paranoia, as well as the tension between self-hatred and self-acceptance, between striving for maturity and refusing to grow up. . . .
“In our capacity or failure to forgive we reveal our ability to recognize the humanity in someone who has hurt or disappointed us, as well as to see our own limitations and complicity. It represents an ability to imagine what life is like on the other side of the fence, where another human being is engaged in his own struggle, to let go of the expectation that people exist to be just what we need them to be. And this sensibility applies to our view of ourselves, too: for forgiving others is nothing but the mirror image of forgiving oneself. Significant acts of forgiveness also entail letting go of a precious story we tell about ourselves, risking the awareness of a larger, less self-justifying truth. I found myself posting several quotations from this book on Sonderquotes. I recommend this book for some deep thinking about all that forgiveness means in our lives. David Fickling Books, New York, 2007. Originally published in Great Britain, 2007. 323 pages. “We took Salim to the Eye because he’d never been up before. A stranger came up to us in the queue, offering us a free ticket. We took it and gave it to Salim. We shouldn’t have done this, but we did. He went up on his own at 11.32, 24 May, and was due to come down at 12.02 the same day. He turned and waved to Kat and me as he boarded, but you couldn’t see his face, just his shadow. They sealed him in with twenty other people whom we didn’t know. “Kat and I tracked Salim’s capsule as it made its orbit. When it reached its highest point, we both said, ‘NOW!’ at the same time and Kat laughed and I joined in. That’s how we knew we’d been tracking the right one. We saw the people bunch up as the capsule came back down, facing northeast towards the automatic camera for the souvenir photograph. They were just dark bits of jackets, legs, dresses and sleeves. “Then the capsule landed. The doors opened and the passengers came out in twos and threes. They walked off in different directions. Their faces were smiling. Their paths probably never crossed again. “But Salim wasn’t among them. This mystery reminds me of The Curious Incident of the Dog in the Night-Time, narrated as it is by someone whose “brain runs on a different operating system from other people’s.” This one is much less grim and offers an intriguing mystery with a believable solution. This book is, fittingly, more cerebral than emotional, since Ted isn’t very good at reading emotions. Though we can see the emotions of everyone in his family are on edge when Salim disappears, and the author handles it well. I’m not sure when I’ve last read such an enjoyable mystery appropriate for middle school students through teens. Ted is a young teen himself, but the reader can believe that he had the insight and noticed the details to solve the mystery. It isn’t a case, as in some mysteries for young people, of just happening to deal with stupid adults. My biggest regret, after reading this book, is that I never went up in the London Eye when I was in London. You are currently browsing the Sonderbooks blog archives for July, 2009.